I read some comment here, well im from Indonesia i had POF account last years but i decide to delete when i find someone from POF. He is from US and we talk online for 7 month till finally we met in real. But its very dilemma when me as Asian women put nothing as my profession on profile coz men in dating site thought I am jobless, but when i put my real jobs and prove my jobs some men run away from me..What d hell is that?? But know POF a lot scammers.. Well be careful. For Guys : be careful coz maybe a lot asian women is jobless and only use u for money n visa n same of them is gold digger and Prost (real i know some ID coz i saw that women in my country as Prost). i upgraded now can't send messages not happy with site. 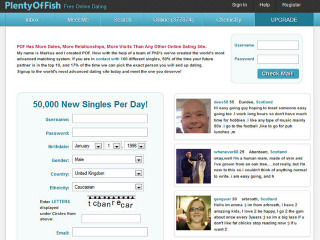 im allready a non paying member of plenty of fish how can i log in now i can not find the member lock on screen since you changed everything. My email is seymore_2003@yahoo.com my my screen name is Baby1954 please help. Who here isn't looking for something or someone new? I have read everything about this website and I think for the first time I have some hope in finding a real person who will see me for who i am. And it seems to provide me with a sense of hope. Thank you. im trying to register and when i sumit my username they say its already in their sistem but its weird cause i tried the most stupid username and even simple letters like chptc and they still wont let me in!! have i been blocked? I find "POF" is a very good Dating and finding a partner site. However, I have one major beef with the founder, and that is a mistake was made on my profile and they have me listed as a "TEENAGER"!!! I'm fifty (50) yrs old. Now when I write to ladies, they don't want to correspond with me because I'm a "KID"!! According to "pof"s" profile of me...Now that's harsh. I've written to a couple of ladies who says they have kids older than me. And, that hurts. Still, I would say they are one of the best Dating Sites around. Respectfully. Anthony. Replied to anthony_4882 @anthony You can just create a new account to fix the problem. It's free? You have a hacker and a scam artist on your site. He goes by the name of MrMagnificentCa he has a Canada zip code, his birth date is March 10 1963 he lives in the United States, his headline is Lets Make Memories. Please remove him or someone is going to get seriously scammed ,or you are going to lose alot of clients. and would recommend it to any single person. I've only had 1 bad date since I've been there. I've meet some really pretty and very nice Lady's , Beat's the heck out of all the pay for online dating site's. Everyone that's complaining just is'nt doing it right! !